Sept. 12, 2017 — For the first time in more than a decade, the Supreme Court of Texas will convene at the University of Houston Law Center to hear oral arguments in two civil cases. 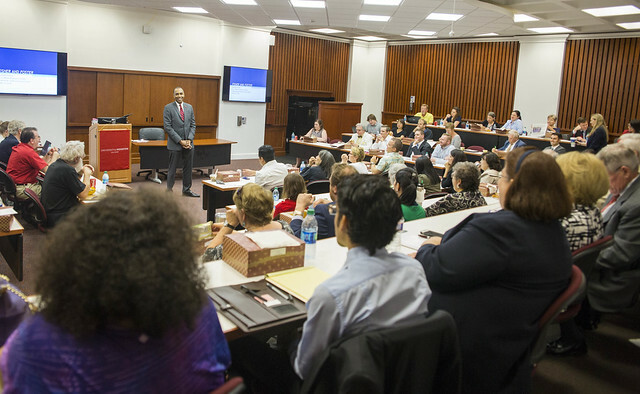 The visit on Friday, Sept. 15, will kick off the UH Law Center's third annual Judge Ruby Kless Sondock Jurist-In-Residence Program, which brings sitting jurists to campus for a day with students, faculty, and the Houston legal community. In addition, on Monday, Sept. 18, Judge Jenny Rivera from New York state's highest court will address the use of the state constitution as a framework for deciding cases. "It will be a great opportunity to interact with the justices and see high-caliber oral arguments in action," said Leonard M. Baynes, dean of the UH Law Center. The justices will hold a question-and-answer session to inform and inspire the next generation of legal professionals. The Texas Supreme Court hears cases outside Austin only a handful of times each year. A 1998 constitutional amendment allowing the nine justices to convene anywhere in the state gives citizens a chance to see the Texas judicial system up close and in their community. The oral arguments will be heard in Krost Hall at the UH Law Center. Doors will open at 8:30 a.m., with arguments from 9 a.m. to 11:30 a.m. Both cases are on appeal from the Fourth Court of Appeals in San Antonio. The first case involves a couple dealing with drug and neglect issues who voluntarily relinquished parental rights to their daughter. While a state district judge found that was in the child's "best interest," the appellate court ruled "best interest" had not been proved. The state appealed to the Texas Supreme Court, arguing that voluntarily relinquishing parental rights is proof of doing what's in the "best interest" of the child. It also argues the parents' appeal did not meet criteria spelled out in the Family Code limiting a challenge "to issues relating to fraud, duress, or coercion in the execution of the affidavit." The second case is a challenge by payday loan borrowers to mandatory arbitration of complaints under terms of loan agreements with the lender, Cash Biz. The borrowers contend the arbitration agreement had been waived because the lender had involved the judicial process by filing criminal bad check charges, resulting in borrowers paying heavy fines and even serving jail sentences. Audience members will be subject to a security screening. Large bags and backpacks are not permitted. Complimentary parking is available in Lot 19B. Cameras are allowed in the courtroom for media covering the event. Chief Justice Nathan L. Hecht will be available for media interviews. The Law Center will host a welcome dinner for the Texas Supreme Court justices Thursday, Sept. 14, at the Sam Houston Hotel (1117 Prairie St, Houston, TX 77002). A private cocktail hour for members of the Court and Dean's Society donors will be from 6-7 p.m., followed by dinner and the program, which is open to the public. Click here to become a member of the Dean's Society. A limited number of tickets are available for the dinner. The cost is $150 per guest and includes valet parking, wine service and a three-course meal. Click here to purchase tickets. The Sondock Jurist-in-Residence Program is named in honor of a trailblazer in law who graduated as valedictorian and one of only five women in the UH law school class of 1962. After practicing law for many years, she was appointed as the first female state district judge in Harris County and later was appointed to the Texas Supreme Court, making her the first woman to serve in a regular session of the court. She was proclaimed a "Texas Legal Legend" by the litigation section of the State Bar of Texas in 2016. The University of Houston is a Carnegie-designated Tier One public research university recognized by The Princeton Review as one of the nation's best colleges for undergraduate education. UH serves the globally competitive Houston and Gulf Coast Region by providing world-class faculty, experiential learning and strategic industry partnerships. Located in the nation's fourth-largest city, UH serves more than 43,700 students in the most ethnically and culturally diverse region in the country.